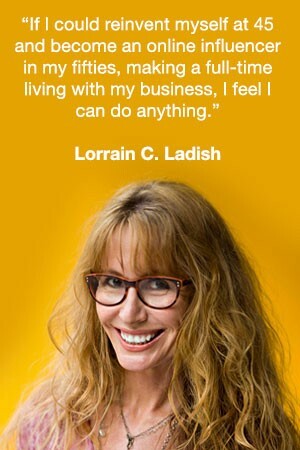 Lorraine Ladish on losing everything, blended families and self-care. Imagine losing your marriage and your income in the same year, and then selling everything you own just to stay off the streets. Now picture doing this as a 45-yo mother of two little girls who desperately need you to love, feed and protect them. Picture the fear, the anxiety and the hopelessness. How would you cope? Lorraine’s story is remarkable not because it’s rare — sadly, hard knocks often travel in packs. What’s remarkable about Lorraine’s story is what she did about it. It’s funny who you bump into once you decide to change your life. I look at the people I respect, admire and follow, and I didn’t know half of them three years ago when I made that fateful decision. Lorraine is one of those people. I don’t know how I found her (often the case), but I’m so glad I did. Reading her stories on Instagram, it soon became clear we shared many of the same struggles. Likewise, our approach to living isn’t that dissimilar (except for the yoga — maybe one day…). A lot’s changed since Lorraine found herself penniless, in debt and heartbroken. What’s amazing is how quickly she turned things around. Like me (and I suspect many of you), she never felt cut out for 9 to 5 work. Born in Spain to a family of writers and raised by her father and abuelita (grandmother), she has now published close to twenty books and is the founder and CEO of the online bilingual magazine, Viva Fifty! She also writes regularly for NBCNews, HuffPost, AARP, BabyCenter, plus a string of Spanish publications like People en Español, La Palma of The Palm Beach Post, Purple Clover, Latina Magazine and Redbook. Her latest book, Tu Mejor Edad (Your Best Age), was published by HarperCollins in 2017. When Lorraine lost everything besides her precious girls, she set about reinventing her life as fast as possible and began by investing $500 to take her writing career online. 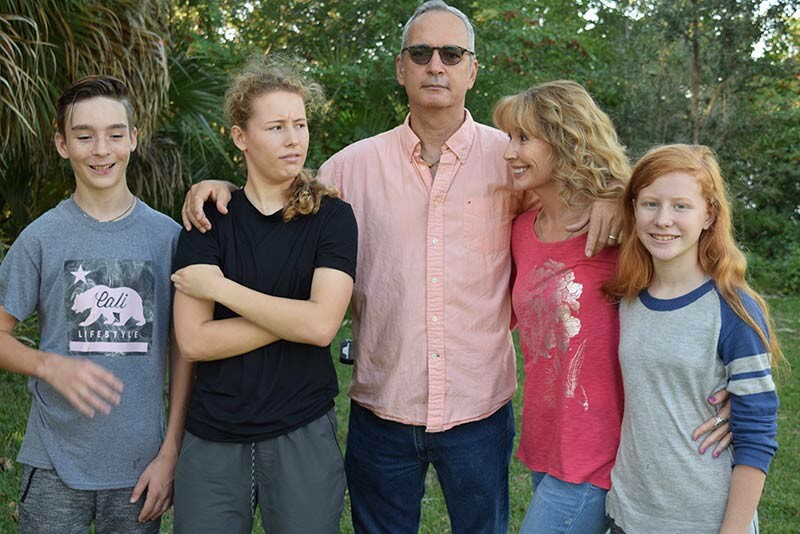 Within a year, she’d replaced her lost income, met the man of her dreams (also a bilingual writer named Phillippe), and began a new life in a blended family, thanks to her husband’s son and a rescued dog completing the troupe. Today, she is a full-time digital content creator with tens of thousands of followers, an accomplished Yogini, public speaker and entrepreneur. At 54, her life couldn’t be more different to what it was ten years earlier. Her transformation proves once again that we often over-estimate what we can do in a year, but underestimate what we can achieve in a decade. Lorraine is a model of determination, consistency and deliberate, intentional action. And it’s my privilege to share with you her insights on midlife, and how she overcame crippling adversity and thrived. I feel like I’m starting to be middle-aged now that I’m close to 55. My Spanish grandmother is 101 so it’s not so far-fetched. I don’t feel one way or another about it. It’s life: you’re young, then you’re middle-aged and then you’re older and that’s that. Is there something you loved to do when you were young that you’ve since ‘rediscovered’ and embraced in later years? Yoga! I started at 12. I did revisit it during one of my pregnancies, at 40, but I was always more into other kinds of sports and physical activities in general: gym workouts, dancing, swimming, long-distance running. An injury to my hip during a half marathon at 48 caused me to back off of running. I found yoga again by sheer serendipity at 51 and almost four years later, daily practice has me at a good place mentally, emotionally and physically. Do you believe middle age (say, 40–65) is different today than it was for your parents? If so, how? I’m not sure. My parents (my dad really, who is the person who raised me), always seemed and still seems young to me. My grandparents, too. I come from a family of active people. Not only active physically but also mentally. At nearly 80 I don’t’ see my dad as “old.” He is my 101-year-old’s grandmother’s primary caregiver. My daughter (his granddaughter) told me she thought he was 64 or so. I asked her to do the math. If he is 64, then he had me at 10! However, my dad was a young parent. He had me at 24. I wasn’t a mom until I turned 37, so that was a huge difference between us. I didn’t feel the responsibility of being a parent until way later in life. Honestly, I haven’t had time to consider any of this. At 40, nearly 41, I was busy having my second baby. That same year I moved from Spain to the U.S. (I’m a dual national, bilingual and bicultural) and had to adapt to this huge change. At 45 I lost my first marriage, my source of income, and I had to sell anything of value I owned to pay the rent and feed my young kids, then 4 and 7. I had no time to fret about age. I focused on finding a way to reinvent my writing career and I did. I took it from print to the online world and the rest is history. I met the love of my life at 46, and we married when I was 50 and he was 49. At 54 I’m still writing books, working on my digital business Viva Fifty Media LLC of which VivaFifty.com and LorraineCLadis.com are a part of. I am getting certified as a yoga instructor, outlining my next books (I have 18 books in Spanish published by traditional trade publishers), and so on and so forth. Perhaps I’ve recently faced the fear of illness — at least four of my good friends have cancer — but I stave the fear off by taking the best possible care of myself, within reason and pursuing my passion which is being a communicator. At the end of each year, I list the habits, practices and beliefs I’m going to say ‘yes’ to and ‘no’ to next year. As a mentor to other mid-lifers, what would be some of your ‘yeses’ and ‘nos’? Keep doing what I’m doing / I feel I live a relatively balanced life and I’m a happy person. Taking on projects that give me mental clutter and not enough money. As Marie Forleo says, if it’s not a ‘hell yes!’, it’s a no. When I was younger I would take on way too much work (I have always worked for myself), out of fear of dry spells. And I hardly ever had dry spells. Now I say no to things that don’t align with my purpose, and sometimes the decision is made from a gut feeling. If I really want to do something, I usually know right away. Also, I realized over time I’m an empath. I’ve learned to distance myself from energy suckers and people who simply drag me down. It’s hard, and in some cases, it’s meant staying away from situations that involve people I love, but I feel so much stronger and more positive now. I learned early on in life that all of my negative traits could be reframed into positive behaviors. That’s how I’m so consistent with sports and work. I have an addictive personality and I’m compulsive, so I redirect that to productive and creative behavior. This requires the blessing/curse of self-awareness. But if I can make the worst parts of me seem like they are my best assets, I’ll take it! What’s a limiting belief you’ve abandoned (or reframed) in the last 12 months? That I needed to do perfect videos on YouTube. I felt they had to be staged, fun, edited. This prevented me from actually doing videos consistently for three years. In January of this year, I simply thought, ok, I will just chat about the things I write about and put it on YouTube … and I ran with that. I started out without editing the videos because I didn’t like watching myself. Now I edit out the ums and ahs. I don’t know what I’ll do next with them. But in January I had 30 subscribers and now at the end of April, I have almost 800. It may not sound like a lot, but hey, these are people who apparently enjoy what I have to say. That gives me fuel to keep on going. Cash flow. Having to explain to my kids some months that I am owed all this money and it’s coming, but it’s just not in my pocket this second. I’ve shown them my accounting software, so they can see how much money I make a year (my eldest couldn’t believe how much, now that she is 17 and has a part-time job and understands the concept of income), but also that the way it comes in looks like a roller-coaster. I use services like Fundbox and Ondeck so I can pay my team on time instead of having to wait for clients to pay my company first. I like to keep money flowing. 54 and just getting started! I haven’t had a midlife crisis, not in the sense that I was concerned about my age. The only age crisis I ever had was at 25, believe it or not. I’ve found it’s not uncommon. It’s an age where you realize you won’t be young forever and a quarter of a century can sound daunting (now I’m over half a century old and it does not feel as scary as 25 did). It didn’t last too long and I have always felt I’m getting better with age. I’m more and more confident and outgoing. I had a relatively traumatic childhood (my mother was out of my life when I was 5 and then had a stroke when she was 28), a severe eating disorder in my teens and young adulthood, and I suffered from clinical depression in my teens, 20’s and early 30’s. Anything that is better than that is better at ANY age. My sister is the survivor of alcoholism and a suicide attempt. She’s doing better than ever in her 50’s. We’re warriors. After 40, what event, decision or perceived risk was pivotal for you? How did it manifest and how did you respond? 2008, the year I lost everything except my kids and hope. If I could reinvent myself at 45 and become an online influencer in my fifties, making a full-time living with my business — to the point that my husband partnered with me — I feel I can do anything. I honestly don’t feel I’ve peaked. I have some interesting projects coming up that only prove my point: when one lives with an open-minded attitude, nothing is a barrier: not age, not your circumstances, nothing. Of course, there are absolutely awful things that could happen and do happen. I’ve even seen parents go through the biggest imaginable loss: the loss of a child, and yet they keep on keeping on and live to tell. If they can, I can too. I tell my husband a lot that I don’t want to wait for tragedy to strike to appreciate what I have. I appreciate it every single day. Regardless of our past, it’s entirely up to us what we do next. Don’t be afraid to jettison practices and people that aren’t good for you. Reframe negative traits into positive behaviors. Reinventing yourself is possible, regardless of past struggles or failures. If this article was beneficial to you, consider subscribing and I’ll send you a little reminder each week when I publish a new post. Get bonus points for sharing with someone you care about. Originally published at Midlife Tribe — Midlife Mastery for Trailblazers. Runs MidlifeTribe.com - for over-40's seeking to master their their 'second act' through proven strategies and personal stories of midlife reinvention.